The above message flashes on TV screens and has been interrupting Arnab Goswami's Newshour show and similar prime time newscasts in Chennai homes for the past two weeks. When an irritated TV viewer in Thiruvanmiyur, Chennai called the local cable operator (LCO), curt came the reply: "You have to purchase set-top-box of Sumangali Cable Vision (SCV).It is priced at Rs. 1200. 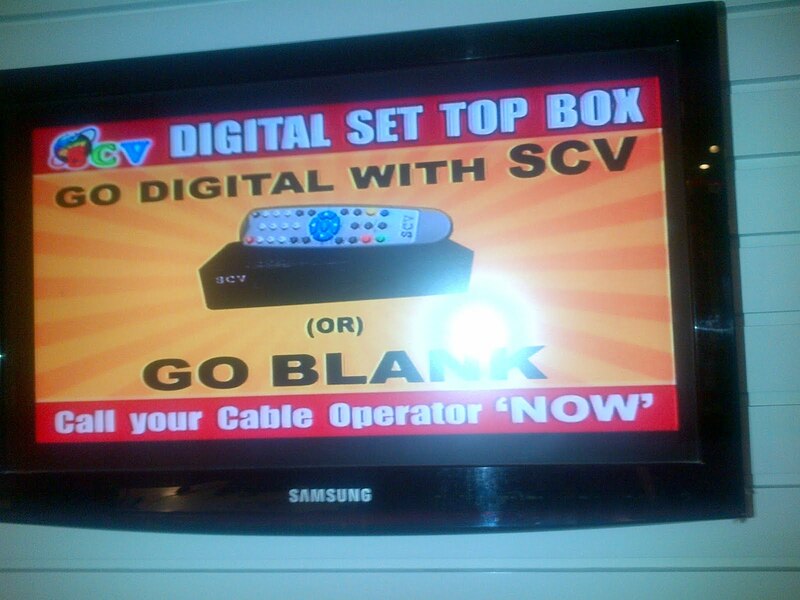 Arasu Cable TV will not be able to distribute set-top-boxes." Such lies, rumours are very much part of business strategy of SCV owned by Marans. These lies and intimidation sustained their monopoly in Tamil Nadu for almost two decades until Tamil Nadu chief minister Jayalalithaa revived Arasu Cable TV corporation in September 2011. However, the state-owned Arasu Cable TV corporation could not launch its operations in the Chennai market which is forty per cent of the entire market in Tamil Nadu. The delay by the Union Information and Broadcasting Ministry (I&B ministry) to provide Digital Addressable System (DAS) licence to Arasu Cable TV corporation indirectly helps Marans-owned SCV to bully the gullible consumers in Chennai. Chennai market which forms 40 per cent of the entire state market needs to be liberated from the clutches of Marans now so that the consumers are not ill-treated and abused by local cable operators (LCO) who act and talk like henchmen of Marans. Telecom Regulatory Authority of India (TRAI) should proactively encourage and invite citizen participation like the Federal Communications Commission (FCC) of the United States. The Centre should incorporate provisions which will enable state government-owned MSOs like Arasu Cable TV corporation to be one of the players in the market. The Centre which is keen on getting 18 Doordarshan channels and Lok Sabha TV through every MSO and makes provisions for it should also use the inputs on monopolies in regional markets and create a level playing field. 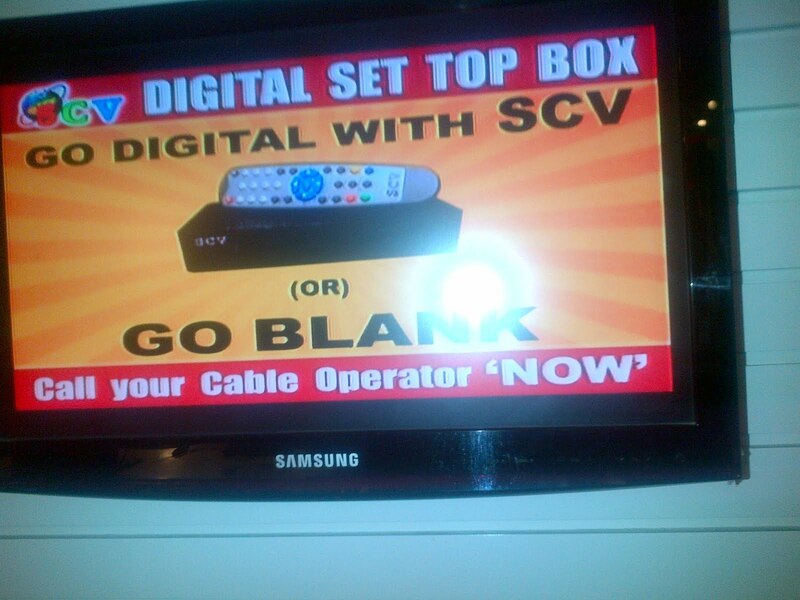 Digital Addressable System (DAS) is a step forward in ensuring equitable distribution of satellite television signals. But the licences given under the new system should not allow back-door entries for existing monopolies such as SCV to continue their dominance at the cost of other players in the market. It is time for the Chennai consumers to wake up and act like responsible citizens. We cannot allow ourselves to be bullied by the Marans who in the past had killed competition from many aspiring Television media entrepreneurs through lies, intimidation and many such unfair trade practices. Let TRAI create decentralised mechanisms with help from state governments and civil society groups to ensure fair play and allow efffective competition in the market.